The sg350x-48p-k9-eu cisco sg350x-48p-k9-eu switch: l3 managed, 48 x 10 100 1000 + 2 x 10ge combo + 2 x 10ge sfp+, rack-mountable, max poe Networking & Wireles was added around November 2018. The best price for the SG350X-48P-K9-EU CISCO SG350X-48P-K9-EU Switch: L3 in Nigeria is ₦ 423462 sold at Senetic and available with free shipping and delivery within Delivery in 3-4 days. Product is also sold at Senetic for a price up to ₦ 423462. 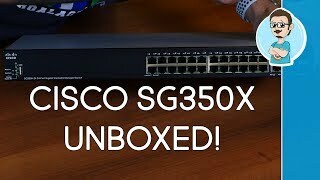 Cisco SG350X-24 Layer 3 Stackable Manageable Switch Unboxing!